Or view larger version. Last West, Kern Co., Calif – Lettuce Strike. 1938. Dorothea Lange. Photonegative strip. Collection of Oakland Museum of California. Gift of Paul S. Taylor. 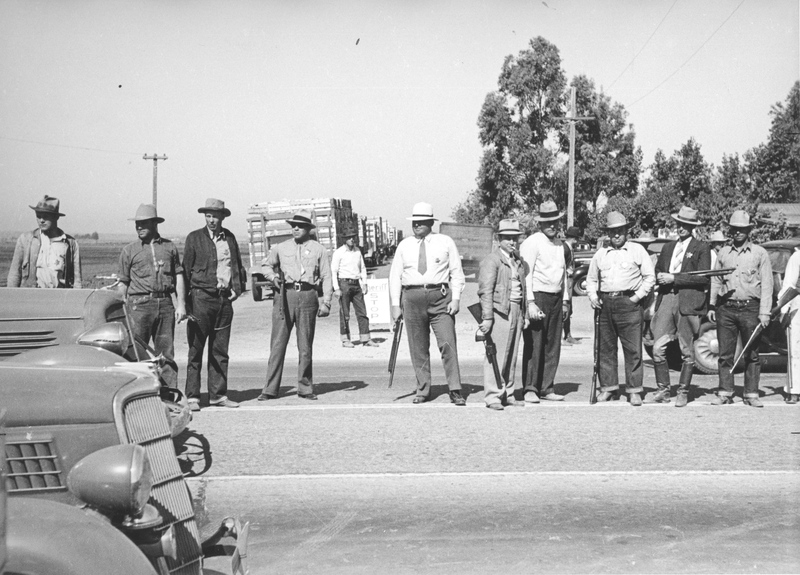 This is a photograph of law enforcement creating a blockade during the Salinas Lettuce Strike, 1936. Sheriff Carl H. Abbott declared the situation “beyond the ability of the regularly constituted law enforcement agencies.” Citing Penal Code Section 723, Abbott commanded all able-bodied male citizens between 18 and 45 to report to his office and assist him in seizing, arresting, and confining persons. Residents were forbidden to congregate on the public streets and public places of the city.